We stock a wide range of PEX plumbing manifolds from leading manufacturers, including Sioux Chief (manufactured in the USA by from high-grade copper and are of the best quality available on the market), Viega ManaBloc & MiniBloc "homerun" series (made in the USA from polyalloy) and others. 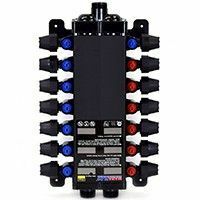 Available with PEX crimp (F1807), expansion (Uponor F1960 ProPEX style), press (Viega) and push-to-connect (Sharkbite style) connections. 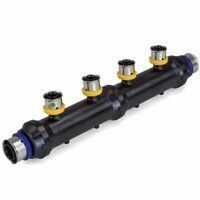 All manifolds in this category are lead-free compliant and are approved for potable water applications. 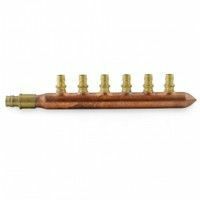 Copper manifolds with F1807 PEX crimp style connections. Available with and without 1/4-turn ball valves in a wide range of sizes. Compatible with all PEX types (A, B, C). Copper manifolds with push-to-connect (push-fit) "Sharkbite" style inlet/outlet connections and branches. No PEX tools needed. Compatible with all PEX pipe types. 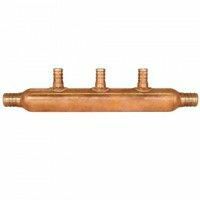 Copper manifolds with standard copper inlets and branches - primarily used as headers for zoning with circulator pumps or zone valves in a heating system. 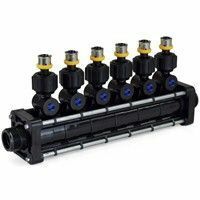 ManaBloc combines hot and cold water manifolds into a 1-piece manifold with 1/4-turn shut off-valves and crimp, press or compression connection options. MiniBloc is a compact version of the ManaBloc for either hot or cold water, but is also available in "dual" options. Outlets (branches) are on a single side. Standard valve-less type polyalloy manifolds with Viega PEX press branches and inlet/outlet connections. Use exclusively with PEX press method. 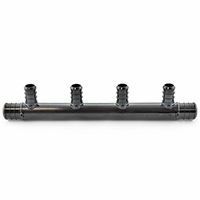 Valve-less polyalloy manifolds with standard crimp style branches & inlet/outlet connections. Compatible with all PEX types (A, B, C). All Sioux Chief manifolds can be divided into two main categories: PEX Manifolds with Valves and Valveless Manifolds. Valved models have 1/4"-turn shut-off miniature ball valves permanently soldered over the manifold’s branches. Regular models without valves have either crimp or push-to-connect outlets. Inlet/outlet options include PEX or sweat connections in sizes from 3/4" to 2" sizes. “Closed” manifolds have a spin closed trunk on one end of the manifold. “Open” manifolds are flow-through and have open outlets on both ends. Branches are spaced at 2" apart on all PEX models and 3" apart for regular models with sweat outlets. Viega was first to introduce the concept of a "home-run" manifold system, where both hot and cold water manifolds were combined into a single compact unit, with added functionality of individual branch shut-off valves and simple, yet versatile, mounting options. The main difference between the ManaBloc and MiniBloc series is the number of outlets (or branches). While ManaBloc is a whole-house manifold, designed to handle anywhere from 6 to 14 (and more) fixtures, the MiniBloc version is mostly used to branch off a main hot/cold water line and provide water to a single bathroom, guest house, small apartment, etc - with anywhere from 2 to 8 fixtures. 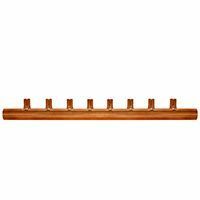 Q: Can I use PEX copper manifolds for radiant floor heating? 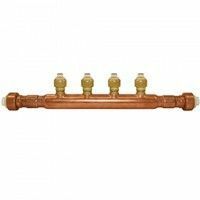 A: Radiant heating applications generally require balancing valves or other means of flow/temperature regulation, which copper manifolds don't have, so we do not recommend the use of these manifolds for floor heating applications unless proper system balancing is present. Under normal conditions, these manifolds are intended for PEX plumbing only. Q: Which tubing types and brands are these manifolds compatible with? A: Outlets on the Sioux Chief PEX plumbing manifolds we carry are crimp style (per ASTM F1807/F877 standard) and are compatible with all types of tubing (PEX-a,b,c), except PEX-AL-PEX. Outlets on the Viega manifolds are either PEX Crimp, Press or Compression type and are likewise compatible with all types of PEX as well as Viega FostaPEX (press version only). Note: Although PEX-a is typically installed using an expansion method, it is still compatible with crimp or clamp connection method and crimp style fittings. Q: How do I tell the difference between a Left hand and a Right hand Sioux Chief manifold? A: In right-hand manifolds, water will be moving to the right, while in left-hand ones, to the left. Q: Can I use Sioux Chief manifolds for a Home Run System? A: Yes, these manifolds are well suited for a PEX home run system and can be installed next to each other by using a bracket support system or standard pipe clamps.